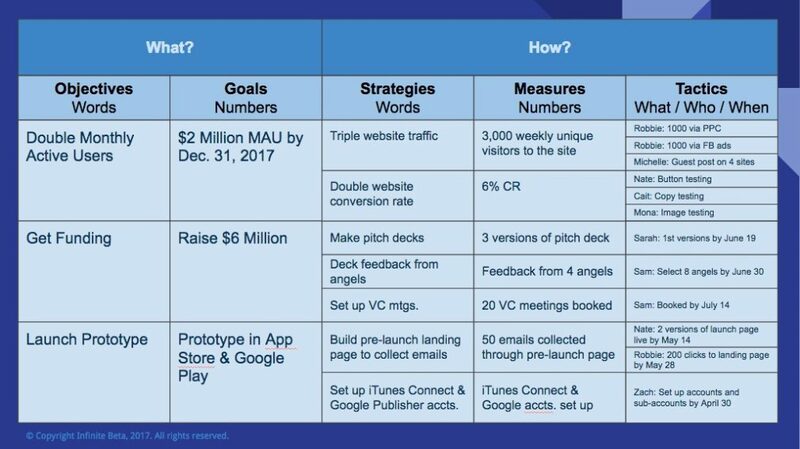 There’s a trend in the tech industry toward OKRs for goal alignment. And while OKRs are good, they’re not great. They try to skip directly from objectives to results and don’t flow downward into the organization well. OKRs are helpful but could be better. Goals are how you measure your progress toward the objective. Your strategies articulate how you’ll achieve your goals. This is where the “official” OGSM model stops but we can take it a little further. The next natural step is to determine the tactics or “levers” you can pull to hit the measures above. This is where the rubber really hits the road. The words → numbers approach is perfect for applying the business’ top-level objectives into the deeper levels of the organization. For example, the CMO’s Strategy (e.g., “triple traffic to our website”) becomes the digital marketer’s Objective. She can then create her own more granular OGSM model from there and determine the levers she wants to pull to reach it (e.g., PPC ads, social media marketing, content marketing, etc.). A quick and dirty example of how an OGSM might look for a software startup. OGSM aligns everyone’s priorities toward the same high-level business objectives. Everyone within the organization has a clear perspective of how their day-to-day work rolls up to the larger company objective. Was this helpful for you? Are you using a version of this at your company? How has it worked for you? Any suggestions for improvement? Add a comment below with your thoughts.